OAK HAMMOCK MARSH, MANITOBA--(Marketwired - Oct. 7, 2013) - Ducks Unlimited Canada (DUC) ambassador, Olympic gold medalist and five-time Canadian champion Jon Montgomery surprised a deserving student over the weekend with a Newalta Wetland Hero Award of Merit. Chelsi Malach, a 19-year-old from Virden, Manitoba, was recognized for her efforts to protect these critical natural areas. Malach is currently studying Environmental Technologies at Assiniboine Community College. Her passion for conservation was ignited while volunteering for DUC's Wetland Centre of Excellence program while attending high school at Virden Collegiate. Here, Malach was one of the lead students who undertook conservation work, led wetland tours and shared her experiences with younger students on DUC-sponsored field trips at her school's local wetland. Since then, her interest in wetlands and wildlife has continued to grow, making her an inspiring role model for the next generation of conservation leaders. "As an ambassador for Ducks Unlimited Canada, a big focus of mine is getting kids active and outdoors. There's no doubt that kids are spending less time outside these days, and they're simply not as connected to nature as generations before," said Olympic champion Jon Montgomery. "Thankfully, there are young people out there like Chelsi who are helping turn the tide by putting their passion for conservation into action." Malach was invited to address DUC's national board of directors, as well as over 150 Ducks Unlimited representatives from across the United States and Mexico at DUC's 75th anniversary "Top of the Flyways" convention in Winnipeg on Saturday. She delivered a speech about the importance of conservation to her generation, and how young people can make a difference in addressing some of today's most pressing environmental issues. "I was so excited just to be asked to speak at this event," said Malach. "So when I also received the Newalta Wetland Hero award, it came as a tremendous surprise! Being personally congratulated by Jon Montgomery is something I will never forget. I hope that I can inspire other young people to take pride and give back to our country in the same way he does." As an Award of Merit winner, one of only ten given out annually across Canada, Malach will also receive $500 to continue her conservation efforts and studies relating to a future environmental career. "As an organization focused on maintaining a clean environment, it is a natural fit for Newalta to partner with Ducks Unlimited," said Stephen Lewis, Executive Director, Corporate Communications & Community Relations, Newalta. "We are proud to support the Newalta Wetland Heroes program and to provide recognition and funding for young people who are doing exceptional work to help protect wetlands." "We're so proud of Chelsi for all that she's done and all that she continues to do in the name of wetland conservation," said Merebeth Switzer, DUC's National Education Coordinator. "Wetlands clean our water, help prevent floods and drought, as well as provide critical habitat for wildlife. But despite the many benefits they provide, wetlands continue to be lost. The support of people like Chelsi is key to ensure these important areas are conserved for future generations." To protect and sustain the health of our natural areas, young people must understand the importance of conservation. DUC's award winning education programs engage young people across Canada and empower them to make a difference in their communities. To learn more about these programs, visit education.ducks.ca. To see the photo associated with this release, please select the following link: http://www.marketwire.com/library/20131007-ducks_800.jpg. Nineteen-year-old Chelsi Malach from Virden, Manitoba was presented with the Newalta Wetland Hero Award of Merit for her work with Ducks Unlimited Canada (DUC) and her contributions to wetland conservation. 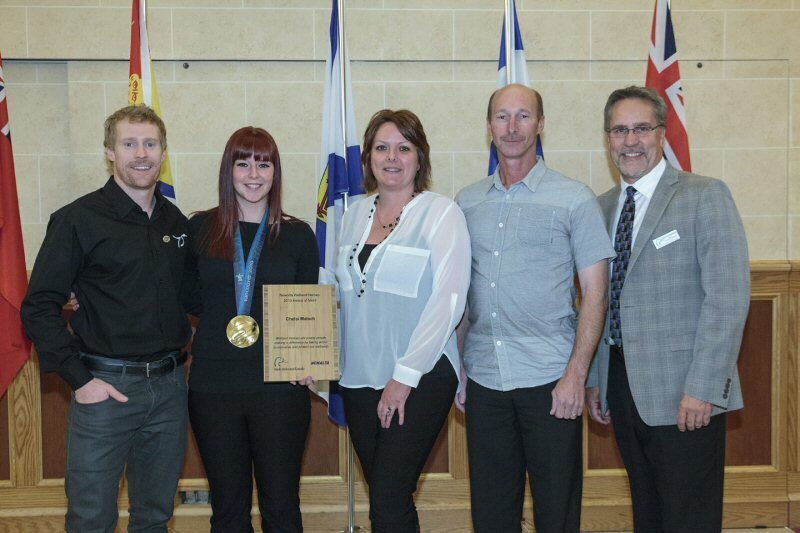 From left to right: DUC ambassador and gold medallist Jon Montgomery, Chelsi Malach, parents Mary and Mike Malach and DUC Chief Executive Officer Greg Siekaniec.